Intensely persecuted during the English Interregnum, early Quakers left a detailed record of the suffering they endured for their faith. 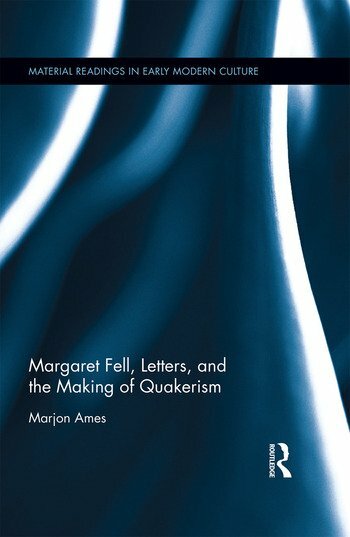 Margaret Fell, Letters, and the Making of Quakerism is the first book to connect the suffering experience with the communication network that drew the faithful together to create a new religious community. This study explores the ways in which early Quaker leaders, particularly Margaret Fell, helped shape a stable organization that allowed for the transition from movement to church to occur. Fell’s role was essential to this process because she developed and maintained the epistolary exchange that was the basis of the early religious community. Her efforts allowed for others to travel and spread the faith while she served as nucleus of the community’s communication network by determining how and where to share news. Memory of the early years of Quakerism were based on the letters Fell preserved. Marjon Ames analyzes not only how Fell’s efforts shaped the inchoate faith, but also how subsequent generations memorialized their founding members. Marjon Ames teaches at Appalachian State University, USA.